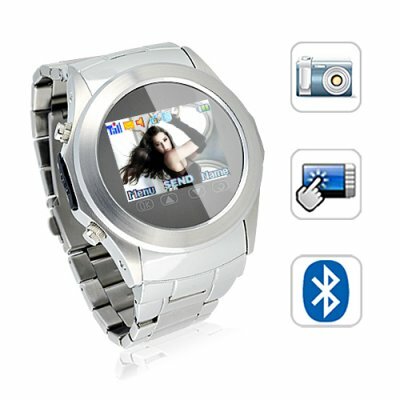 Successfully Added Megatron Quad Band Touchscreen Cellphone Watch With Bluetooth to your Shopping Cart. The Megatron - the perfect combination of fashionable cellphone watch with a feature-packed media player. It's a high-class and elegant quad-band cellphone watch that looks good with a business suit or a pair of jeans and runners. In fact, it'll soon be your favorite accessory because it entertains too! At first glance of this luxurious mobile watch phone, your eyes will be attracted to the flawless stainless steel construction. Perfectly reflective and smooth to the touch. The Megatron comes with a beautiful 1.3 inch glass covered LED display and plenty of advanced phone functions under its covers. It's roughly the same size as a regular dress watch so you'll be making a statement without looking like you're wearing a nerdy power bracelet. For convenience and mega-productivity, nothing beats The Megatron! It brings together cutting edge technology and extra special features like Bluetooth functionality for easy access to handsfree calling. what's more, the 1.3 inch touch screen allows for easy menu navigation and quick dialing. Though it comes with a stylus, the screen is big enough for your finger taps no problem. included stylus just use your fingers. Most importantly, The Megatron can be use everywhere in the world since it supports all for quad band GSM frequencies (850MHz, 900MHz, 1800MHz, 1900MHz) and is fully unlocked phone. On top of everything, The Megatron watch cellphone is a full multimedia center that features a camera, camcorder and video player, MP3 player, and sound recorder. Easily capture photos, video, and audio - all with just the click of a button. This amazing watchphone allows you to playback all your media files directly from the 1.3 inch LCD display or even transfer them to your computer for later viewing. The Megatron is a quite a transformer as it goes from being a great watch, cellphone, to multimedia player with ease and style. What are you waiting for? click "add to cart" right away! The Megatron Watch Phone is available in our warehouse right now and ready to make your life more colorful and lucky. Brought to you by the online leader in Wholesale Watch Phones - Chinavasion. Is the Megatron water proof? No,the Megatron is not water proof. So keep the product dry ,keep away from rain,moisture and liquid which may contain corrosive matter. This watch has good quality. on 2011-01-29 23:32:36 Comfortable Watch !!! Delivery was fast. Cellphone Watch fully satisfactions me.